It seems that at least one 4-20 mA (milliamp) measurement is required by our typical customer, and the way to do it is a constant source of confusion for many. So I thought I’d zero in on the various 4-20 mA current loop configurations and elaborate on the specifics that you need to know to make a successful measurement. The following discussion is ordered from the most to least common configuration, and I hope to cover all those that I have encountered in customer applications. If yours isn’t included, please use the comments section to fill me in. Sensors or other devices with a 4-20 mA current loop output are extremely common in industrial measurement and control applications. They are easy to deploy, have wide power supply requirements, generate a low noise output, and can be transmitted without loss over great distances. 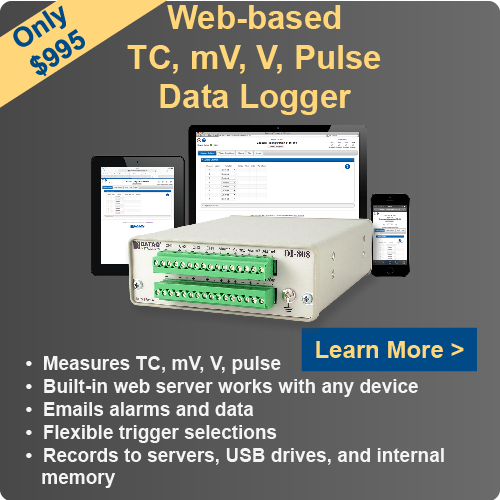 We encounter them all the time in both process control and basic measurement data logger and data acquisition applications. The idea behind 4-20 mA current loop operation is that the sensor draws current from its power source in direct proportion to the mechanical property it measures. Take the example of a 100 psi sensor with a current loop output. With 0 psi applied, the sensor draws 4 mA from its power source. With 100 psi applied the sensor draws 20 mA. At 50 psi the sensor draws 12 mA and so on. The relationship of mechanical property measurement to current output is almost always linear, allowing the resulting current loop data to be scaled with a simple mx+b formula to reveal more useful measurements scaled into engineering units. How you actually measure the 4-20 mA current loop signal is a function of the sensor’s architecture and the capabilities of the instrument you’ll use for the measurement. Most configurations that follow will show a DC voltage excitation source that I denote as “E”. Many who use current loop sensors for the first time are surprised to learn that they need to supply this excitation source. Nonetheless, unless the sensor is self-powered (i.e. AC line powered) an external dc source is required. The good news is that this can sometimes be supplied by the instrument, and the range of acceptable values is usually very wide, typically 10-24 V dc. Here’s a bit of trivia for you: No instruments measure current directly. They all do it indirectly by measuring the voltage dropped across a resistor of known value, and then they use Ohm’s Law to calculate actual current. The resistor is referred to as a “shunt”, is absolutely required to make a current measurement, and is either supplied externally to, or built into the measuring instrument. For clarity, I assume that it’s supplied externally. This is the 4-20 mA current signal generated by the sensor. Note that some sensors may draw 0-20 mA and even other values, but the vast majority of them use the 4-20 mA convention. This is the voltage drop across the shunt that is actually measured by the instrument. Since our industry has standardized on a shunt value of 250 Ohms, “v” will range between 1 and 5 volts for a 4-20 mA current loop signal (v=i * resistance). Note that shunt resistor value is arbitrary as long as it’s known. You also need to ensure that it doesn’t burden the loop, so lower values are better than higher. Yes, I mean lower. Remember that we’re working with current, not voltage, so the rules are inverted. Just as infinitely-high resistor loads work well for a voltage source, you can take the load all the way to zero Ohms for a current source without consequence. I promised to order these configurations from most to least common, and the self-powered sensor just noses out the first runner up. Self-powered sensors are those that, well, power themselves. The sensor may have an integral ac power supply, thereby negating the need for an external DC power source. Or it may not be a sensor at all. It could be an output from a PLC or other source that is internally powered. Okay, this can get confusing for first-time 4-20 mA current loop users. Yes, it is possible to both power the sensor and measure the current it draws over the same two wires. In the 2-wire examples shown here, only two wires connect the sensor to its power supply, and the sensor draws current from it in direct proportion to the mechanical property that it measures. As current changes, the voltage developed across resistor R will change, thus providing a signal that’s suitable to connect to a measuring instrument like a data logger or data acquisition system. In most situations, care should be taken to place the resistor in the low-side of the loop as shown here, as opposed to the high-side. Doing so will allow non-isolated instruments to make the measurement. In the next section, I’ll deal with a high-side shunt placement and discuss these cautions in more detail. This configuration is almost exactly like the low-side, 2-wire approach, but it places the shunt resistor in the high-side of the loop. Note that while the voltage across the resistor is proportional to the current drawn by the sensor (just like the low-side approach), there is also a common mode voltage (CMV) present on either side to ground. On one side to ground the CMV is equal to the supply voltage. On the other side to ground it’s equal to the supply voltage, less the voltage dropped by the resistor (v). The presence of the CMVs places conditions on the instrument that you use to measure v. Specially, the instrument needs to have an isolated front end so it can float to the level of the CMV and still successfully make the measurement. Try this with a non-isolated, single-ended instrument and you will short-circuit the sensor to ground. A non-isolated differential instrument will either saturate or provide erroneous results. 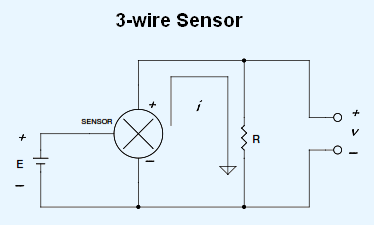 Three-wire sensors with a process current output have a separate wire for ground, signal (4-20 mA), and the power supply. This configuration is the easiest for current loop beginners to grasp, one input for power and a second for the current loop with a common ground. The primary advantage of a 3-wire sensor over its 2-wire counterpart is its ability to drive higher resistive loads. 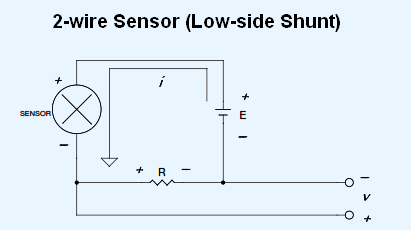 Resistors drop voltage for any given current in direct proportion to their resistance value. Holding current constant, higher resistances drop more voltage. Turning back to the 2-wire sensor and holding current constant, as the shunt resistance increases the voltage drop across it also increases. 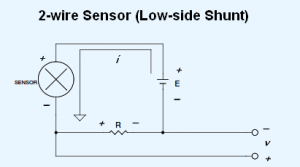 You might reach a point where the voltage dropped by the shunt lowers the voltage drop across the sensor below the minimum required for it to operate properly. We had a customer whose 2-wire current loop measurements functioned beautifully until loop current reached about 18 mA, at which point everything went haywire. Upon close examination, we determined that the supply voltage she used was too low by at least 0.56-V. She needed 2 mA more measurement to reach full scale, which translates to 0.56 V with her 250-Ohm resistor. The solution was to use a higher voltage power supply to ensure that the voltage drop across the sensor stayed above the minimum level. She could have also used a 3-wire sensor, which ensures that the voltage applied to the sensor is independent of shunt resistor voltage drop. You irreparably damage the instrument. Ensure that the loop power source is isolated. This means that its output ground (the one connected to the sensor) is not tied to its input ground (the one that connects to AC line power.) An isolated power source means that the output ground can be tied to another ground (like a non-isolated instrument) without consequence. If using self-powered sensors, ensure that the low-side of the loop is isolated from its power source. If you lack control over the power sources and determine that they are not isolated, then your only option is to power ALL devices (power supplies, self-powered sensors, the instrument, and its connected PC) from exactly the same power outlet. Don’t make the mistake of using outlets that are close to each other. If you run out of receptacles on a single outlet, then use a power strip. Again, it’s worth repeating that all of the cautions associated with proper grounding disappear if an isolated instrument is used to make the measurement. Sensors with 4-20 mA outputs are encountered in all disciplines and in many configurations. 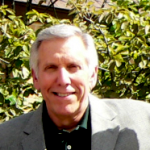 Contact us with any questions that arise in your unique situation. Just got our first 2 new units. They look great thanks. I am trying to figure out a simple method for customers to set up the logger. If we set the logger up 0-100% = 4-20 mA for all flows. The customer can then copy into a spreadsheet and do a converison. We constantly get calls on how to set it up and wonder how we can eliminate setting up the meter and the logger to match. Any ideas would be welcome. The neg flow here is obviously when the current was off. Nothing prevents you from deploying the logger with its default 0-100% scaling for a 4-20 mA input. However, since scaling has to be done somewhere, you’d need to multiply acquired percentages by the full scale range of the sensor to yield meaningful units inside Excel. I do, however, have an issue with the statement “No instruments measure current directly.” An analog panel meter without a shunt resistor does exactly that. It takes a current and its resultant magnetic field and deflects a pointer that is read on a calibrated scale. How it has been come up with an idea to use specifically 4-20 milliamp. You recommend to take the shunt resistor lower. But this resistor is connected parallel to the power supply. If it is too low, can it damage the power supply. 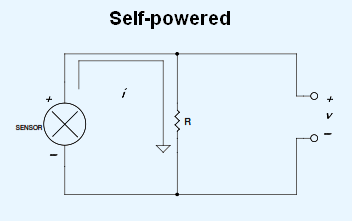 If to consider the schematic #1 (“self-powered”). There is current “i” produced by the sensor. But the overall current flowing through the resistor will also include the (Vsupply/Rshunt)? In no configuration is the resistor in parallel with the power supply. 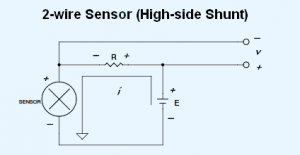 It is always in series with the sensor and power supply, so its resistance can decrease to zero without consequence. In answering your second question, the self-powered configuration removes the power supply from consideration. Hi Igor. I think as it’s appear by it’s name “Self-Powered”, i think it doesn’t needs any external power supply, it gives output by it’s measured mechanical power … so the resistor is in it’s series with sensor . and the poles u see in figure are output point of signal .. not a input power . As i think . You can do that, but as the article mentions, larger shunt resistances burden the loop more. Ideally the shunt value should be zero Ohms, but that isn’t practical. As shunt resistance increases voltage drop across it increases in direct proportion to loop burden. Eventually you reach a point where the loop fails to function. Hello Nick , as you said you will get 10V if u apply 500 Ohms resistance, but maximum ADC system measures 5V as max input , so the getting 10V from sensors output is just a useless because we will have to decrease that . I’d like to measure the current coming out of a battery. I can place a small series resistor (say, 1ohm) at the negative port of the battery and measure the voltage across it with my DI-149, but the voltage is quite low (0.1-0.5 volt), and the measurement resolution of your device is not sufficient. Any ideas on how to better measure this without dropping too much voltage on (A bigger) resistor? We want to use amplitude collected at 4.8 Khz (frequency) using a GSM module – via GPRS to a cloud or a server. similarly we want to do for 38 Khz as well. any solution that we can deploy. We propose to use a Pizeo crystal in a SS encasement. How to make accurate reading at receiver side in noise medium. Excellent article, well written and comprehensive, well prioritized. Obviously the product of an orderly mind. Thanks! How can I interface 2 wire sensor which give 1-5 volt drop against 4 – 20 mA current loop? 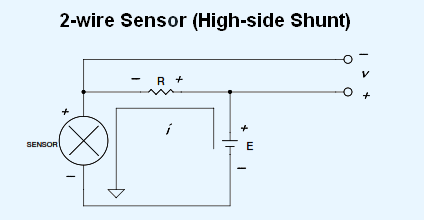 If your sensor has a 1-5 V output the manufacturer has built a shunt resistor into the device to provide a voltage output. Therefore, no external shunt resistor is necessary. please how do I use my digital multimeter DT9205 to carry out 4-20mA to simulate a loop powered sensor for its calibration. The sensors are humitter and barometer. Thank you very much for sharing the knowledge with others. You have articulated the concepts very nicely. I have a question for you… The question is infact an observation that i have been facing for last 2,3 years. Spikes are being observed in a 2 wire looped power level transmitter installed on vessel in a facility where i am working. I have done all possible checks, configuration, re-configurations to address the issue. And luckily, situation has gone quite acceptable now. Only one spike is observed in its reading. As per my understanding, this too is in fact an actual spike due to process disturbance. but i intend to suppress this spike as well. I am intending to install an inductor in its loop to suppress this sudden change in mA values. How is the idea and what are your inputs regarding this way forward. I HAVE A DEW POINT TRANSMITTER WITH A 4-20mA ANALOG OUTPUT. I WANT TO MEASURE 0-20-LBS/SCF. THE SCALING IS IN DEG.C SO BY DOING A CONVERSION 20 LBS. = -29.1 DEG. C.
I SET THE RANGE AS -100 = 0 LBS., AND -29.1 DEG. C =-20 LBS.